LAWRENCE — The Jayhawk Motorsports team will unveil its new built-from-scratch cars at a public event in Downtown Lawrence later this month. 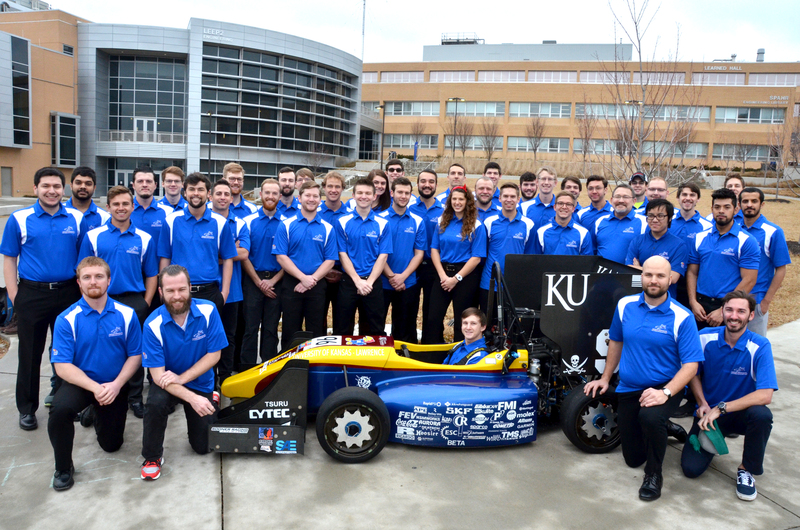 The team — composed of students from the University of Kansas School of Engineering — designed and built two vehicles this year, as it has since 2012: One runs on electricity, the other on ethanol combustion. The cars are being entered in intercollegiate contests at Michigan in May and Lincoln, Nebraska, in June. Both competitions are sponsored by the Society of Automotive Engineers. Jayhawk Motorsports hopes to build on the success of its predecessors: The team was created in 1994 — last year, the combustion car took third place overall at the Lincoln competition. The team also won first place overall at the competition in 2012 and 2014. "We've had a lot of success,” said Zachary Jones, a senior in mechanical engineering from San Jose, California. “Part of it, we do a great job building on what we've already done. We really try to improve on previous years." The concept behind the competition is that a fictional manufacturing company has contracted a design team to develop a small open-wheeled single-seat race car. The winner is the car determined to have the best overall package of design, construction, performance and cost. This year’s entries feature new innovations for the team. The combustion car, for example, features both a turbocharger and an active aero-braking system. The electric car, meanwhile, features four-wheel drive for the first time. “We think this will give us a huge advantage in the competition this year,” Jones said. At competition, the cars will be judged in static and dynamic events. The “static” events feature presentations on design and the ability to sell the car. "We try to treat our project like it's a company,” Jones said. The dynamic events involve putting the car through its paces — how it handles a “skid pad,” how fast it accelerates and its overall endurance. “We really test our car to see how robust and how well-built it is,” Jones said. Jayhawk Motorsports has been at work since fall, designing and building the two cars. The competition gives students a chance to get a feel for a real-life engineering project with its demand for a variety of skills. "It's a lot more than strictly building a car,” Jones said. “It's learning to work with people, make decisions and implement design decisions to produce a complete product." The cars compete May 9-12 at Michigan and June 20-13 at Lincoln. The cars are on display for public viewing at 5 p.m. April 28 at the Oread Hotel, 1200 Oread Ave.